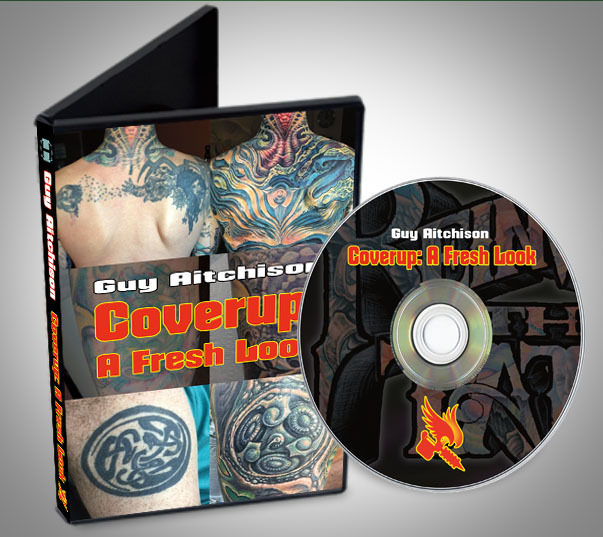 The first seminar I ever gave, over 20 years ago, was on the subject of coverup tattooing. As the tattoo art form continues to evolve and grow in popularity, knowing what to do about unwanted tattoos is becoming more and more crucial for tattoo artists. Despite the enormous artistic growth in tattooing over the past two decades, there still seems to be a fundamental gap in understanding what coverup tattooing is all about and how to avoid making dark, dense, obvious coverups. So I've been gathering photos and video clips over the past five years or so which I've just finished crunching into a comprehensive tutorial. For subscribers to Reinventing The Tattoo, it comes free with your subscription as a part of the curriculum. Simply log on and check the Table Of Contents, and you'll find it in Part 8. It includes chapters on several different types of coverup projects from small, single-pass pieces to large, epic transformations, and everything in between. It also goes into detail about the laser, showing several sample projects and discussing in detail the realities of the laser, including a lengthy FAQ that you can share with your clients when talking about the possibility of laser treatments. There is also a chapter on scar coverups, with examples of surgical scars, burn scars, electrical burns and other types of scarring, with strategies for effectively tattooing over even the trickiest skin. In addition, the tutorial includes a recent video production of mine. 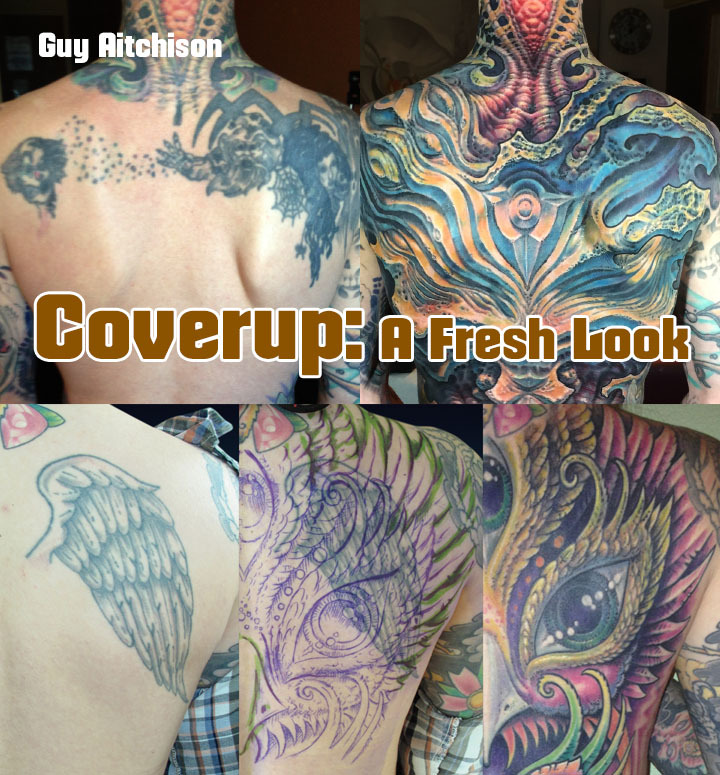 Coverup: A Fresh Look was filmed at the 2015 Worldwide Tattoo Conference, and was designed to go over the most crucial theory behind what makes coverups either work or not work, and shows many examples in both photo and video form, alongside a detailed discussion of each example. The live format also allowed for some insightful audience questions to round out the program. This video comes free as part of your Reinventing subscription, or can be purchased separately as a DVD for non-subscribers. If you are not yet a Reinventing The Tattoo member, it's a subscription-based educational package that gives you access to the entire Reinventing curriculum, which comes in a combination of e-book and video format and covers everything from the fundamentals of good tattoo design to working with references, using digital tools, expanding your skills through painting and other mediums, plus exhaustive chapters on tattooing technique. Since the electronic edition was released in October we've been steadily expanding the curriculum with guest chapters by Russ Abbott, Nick Baxter, Megan Jean Morris, Don McDonald and Halo Jankowski, plus new chapters by me about rotary machines and needle cartridges. We have a chapter in the works from realism maestro Phil Garcia, plus a number of other guest chapters that we'll be adding throughout the year by some of the industry's biggest names. The coverup chapters are just one of the many things that we've added this year to this expanding, high-power educational package. Drop by ReinventingTheTattoo.com if you want to read more about it.